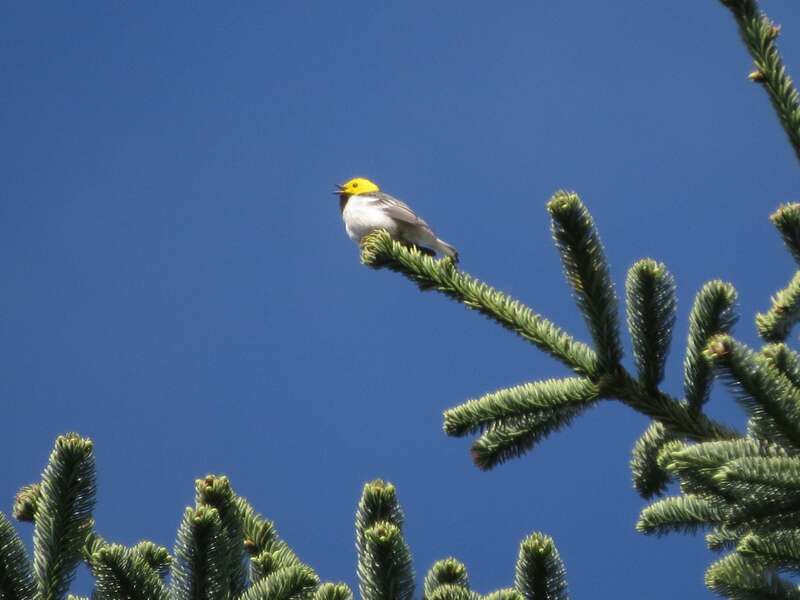 I hadn’t given up hope on finding a Hermit Warbler after my Johnson Road trip. 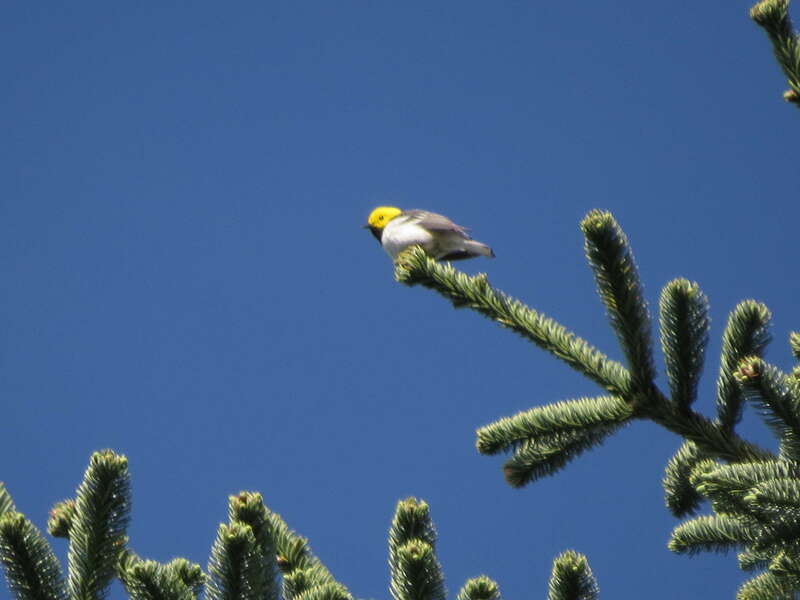 The following weekend, I conferred with BirdsEye and decided to try my luck at Larch Mountain. Funny thing about Larch Mountain, larch trees don’t actually grow there. 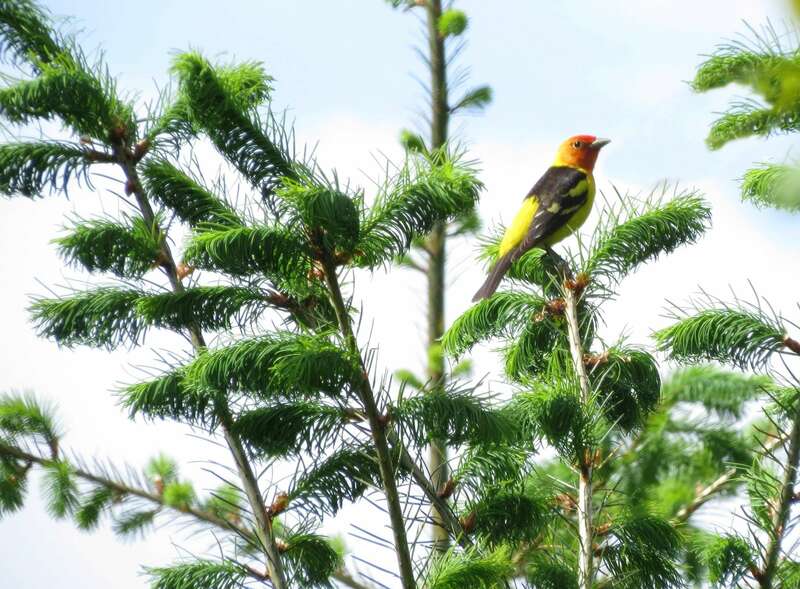 Noble fir is the dominant species that was once marketed and sold by early loggers as the more profitable timber, “larch.” Hence, how the mountain got its name. Tsk, tsk. Anyways, my love for abandoned logging roads is growing. I pulled over on the first one I could find. 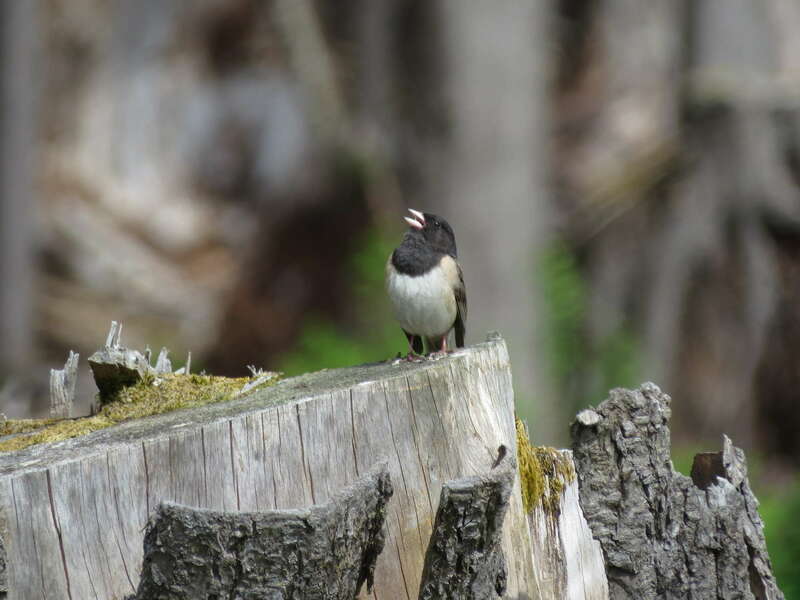 There were Dark-eyed Juncos trilling. And Orange-crowned Warblers trilling that sounded like Dark-eyed Juncos. 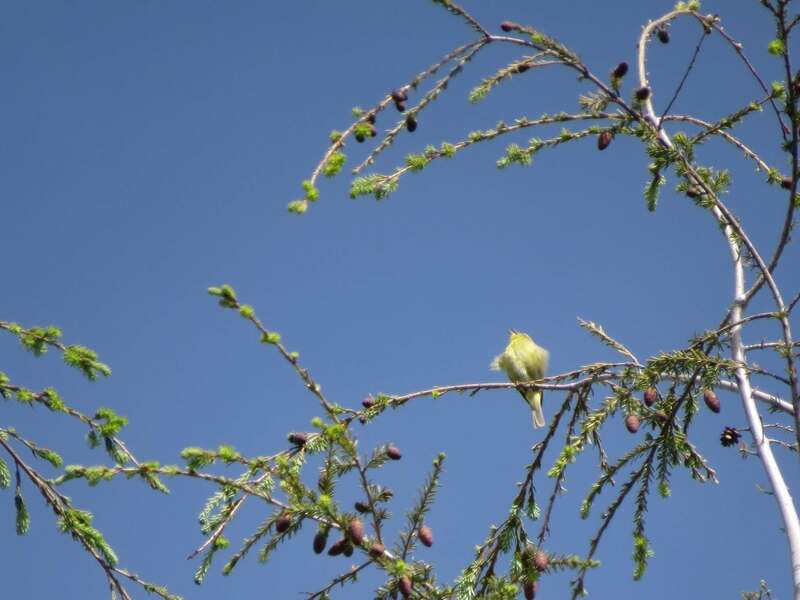 I got a better view of the MacGillivray’s Warbler. 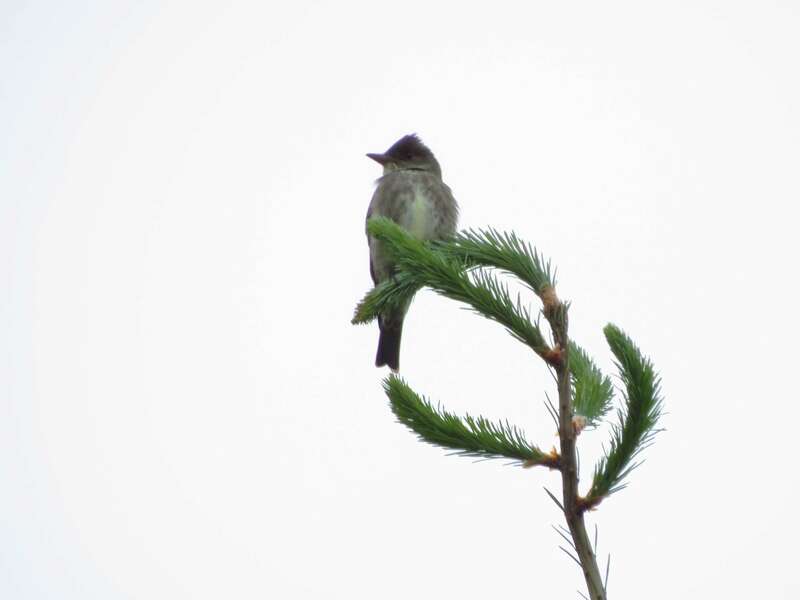 Consensus on Whatbird was mixed, but the best guess (I think) is Myiarchus sp. 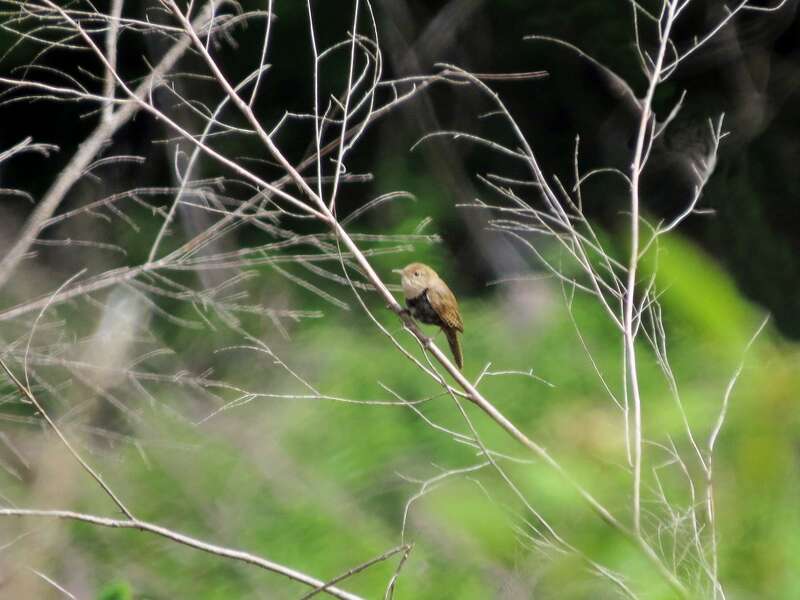 possibly an Ash-throated Flycatcher (? 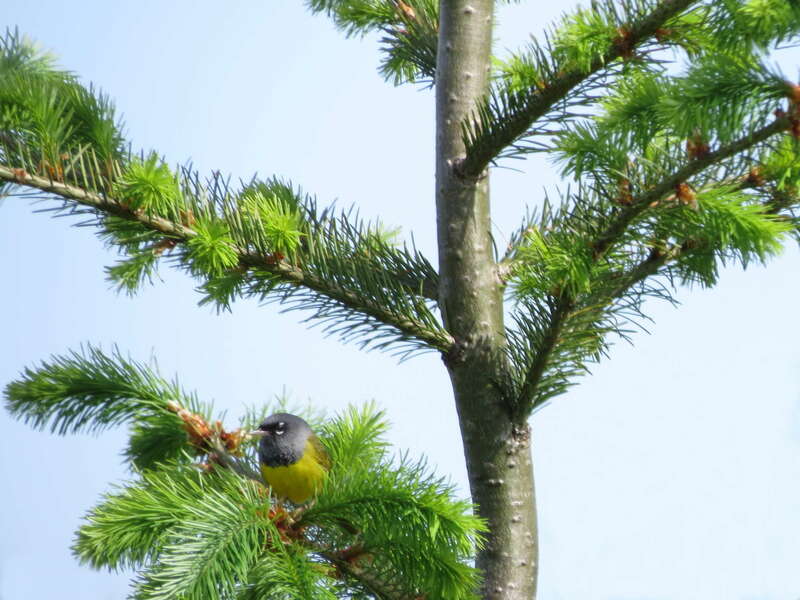 ), based on the pale yellow belly and dark upperparts. I didn’t get a look at its tail and didn’t hear a song. Western Kingbird was another consideration, however, to me the yellow on the above bird’s belly looks too pale in comparison with kingbirds. Toughie! 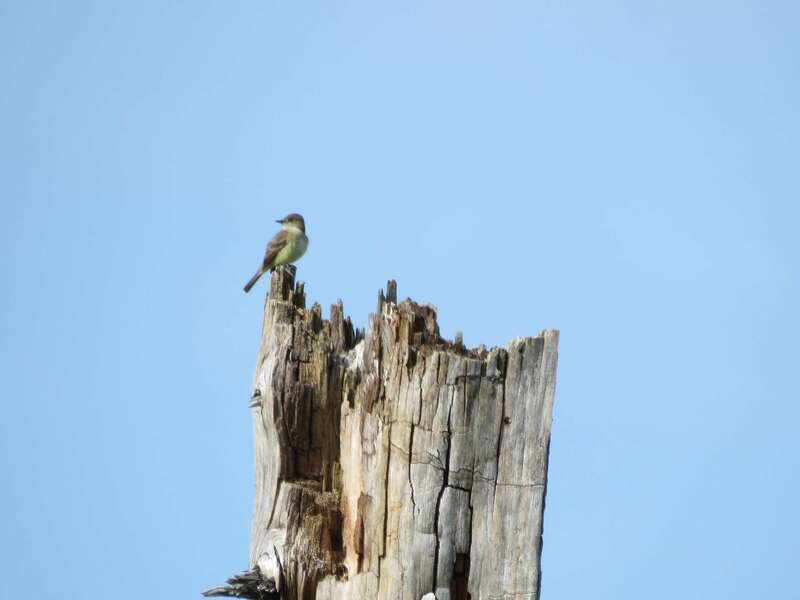 I was luckier with these flycatchers who identified themselves by song. I propose re-naming them according to their bird song to make their names easier to remember. I saw Fitz-bews, Quick THREE beers, and Tseet pwe-eet tsips – okay, maybe that one should remain Pacific-slope. 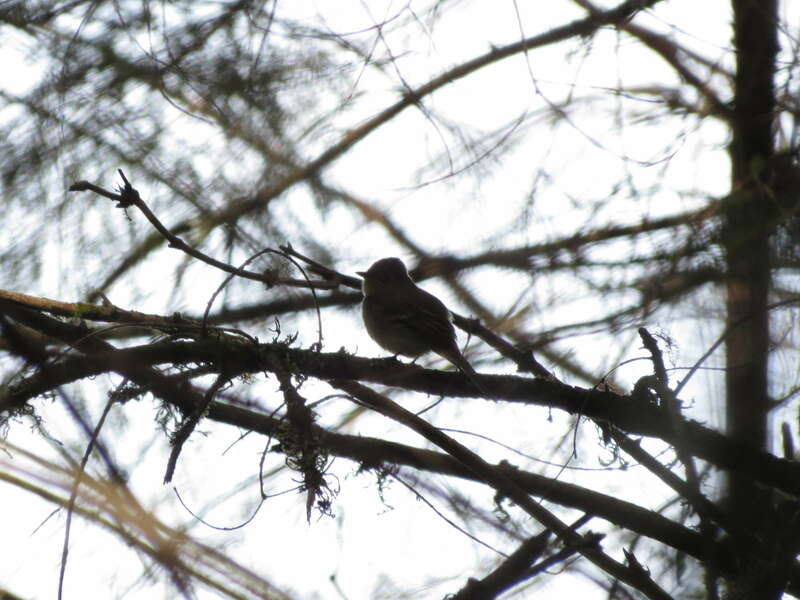 Hidden in the trees, I’m glad this Pacific-slope Flycatcher sang! Huzzah! The hermit finally came out of hiding. It’s funny how little effort it took once I got there. 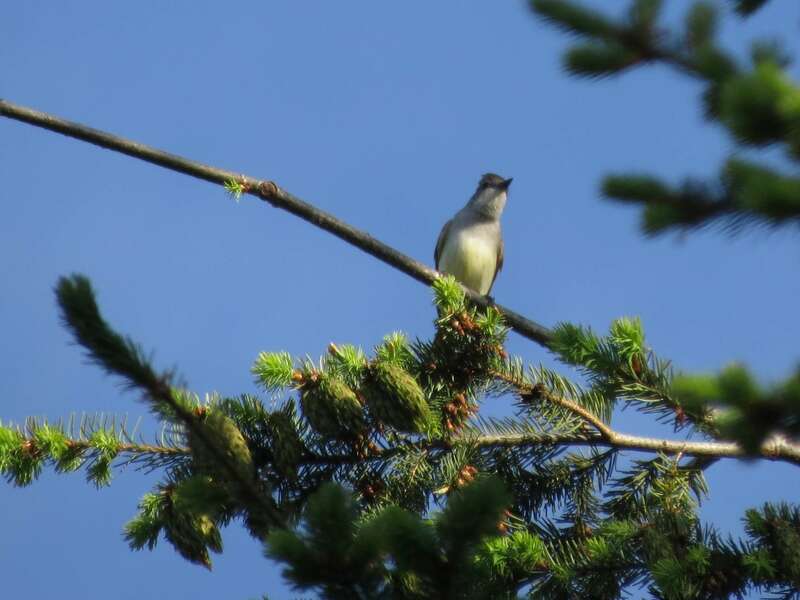 I exited my car, took two steps onto the trail, and bam – there it was, perched in the trees less than 5ft from my face (of course, I wasn’t quick enough with the camera to get that shot). I followed it as it flew back towards the parking lot area and I hung out for a while, listening to it’s chipper song, zee-zoo-zee-zoo-zeezee-zeet. 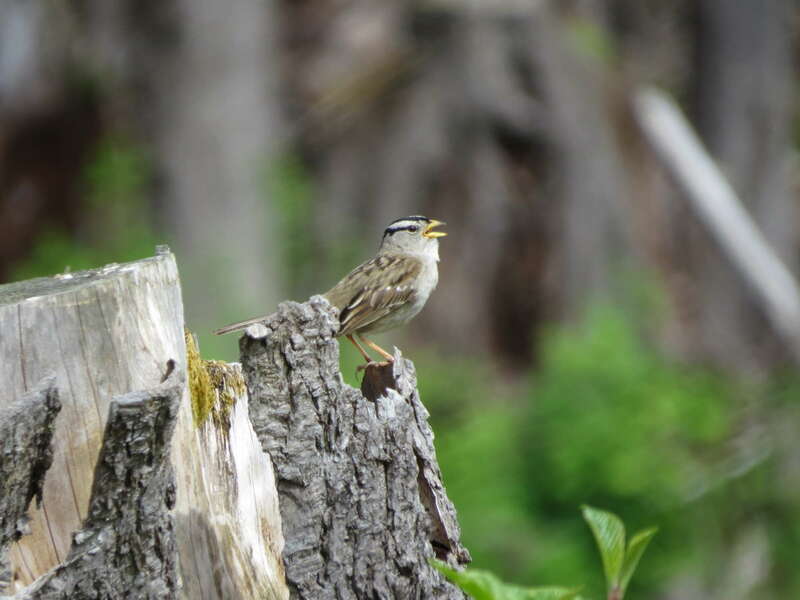 This entry was posted in Birding Trips and tagged Dark-eyed Junco, Hermit Warbler, House Wren, MacGillivray's Warbler, Olive-sided Flycatcher, Orange-crowned Warbler, Pacific-slope Flycatcher, Western Tanager, White-crowned Sparrow, Willow Flycatcher by audge29. Bookmark the permalink. Lovely! I’ll have to make a run up there, to see what I can find.